Live in San Diego long enough and it won’t be long before you start seeing images pop up on people’s Facebook page of them standing on a thin, very precarious looking piece of rock jutting out high into the sky. 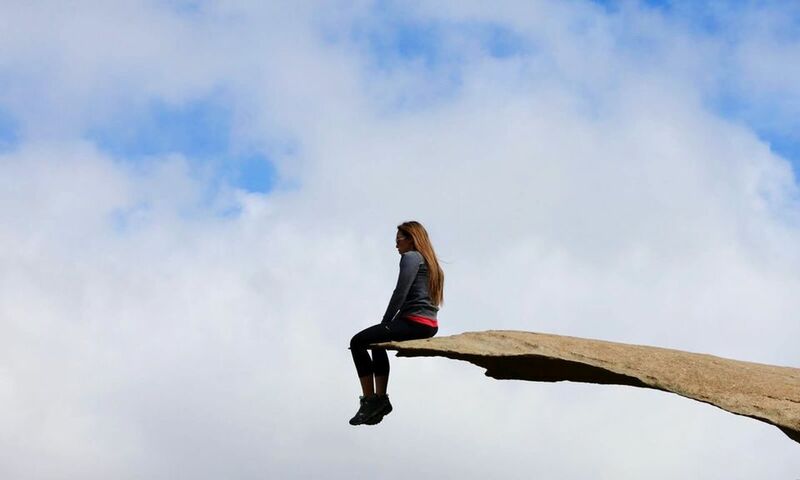 The iconic piece of earth is Potato Chip Rock and you can reach it by hiking up Mt Woodson in the San Diego County suburb of Poway, California. The Mt Woodson Trail is part of the City of Poway Trail System and is located next to Lake Poway. The entrance is at 14644 Lake Poway Road. Lake Poway and the Mt Woodson Trail is accessible daily from 6 a.m. to sunset. There is a large parking lot at the base of the trail so finding parking isn’t usually a problem. While accessing the trail is free, there is a $5 charge to park your car or RV ($2 for motorcycles) if you are a non-resident of Poway. Residents of Poway can park for free. Picnic tables and grassy areas are located next to the parking lot and there is also a restroom just before the start of the trail. Be sure to use it because besides passing a porta-potty about 30 – 45 minutes into the hike, you won’t come to another bathroom. The Potato Chip Rock hike is a roundtrip San Diego hike to the top of Mt Woodson and back down that lasts 7.5 miles. The first part of the hike takes you on an elevated path that curves alongside Lake Poway. You’ll get excellent views of the pretty lake and will probably see small boats on it with people fishing. The trail continues to get steeper and is one reason this is one of the toughest hikes in San Diego County. At the top, you’ll see Potato Chip Rock. It’s hard to miss and there is almost always a line of people waiting to get their picture taken on the rock. Start the hike first thing in the morning to avoid the line. When up there, be courteous and just strike a couple poses so you can quickly get down to let the next people in line take their turn. Bring plenty of water. There is nowhere to get water along the trail. A camelback-style backpack can be very handy if you don’t want to lug a water jug with you for nearly eight miles. Wear a hat and/or sunglasses to protect your eyes from the harsh sunlight. Put on sunscreen before departing on the hike and reapply at the top or as often as you need. Plan your hike for the morning instead of the afternoon to avoid the hottest part of the day. Wear sturdy hiking shoes. There are many loose rocks and steep, narrow inclines so you’ll want shoes that protect your feet and ankles. Consider hiking poles. These can help you keep your balance on any loose terrain on the trail plus will help prevent hurting knees if you usually have a problem with joint pain. Stay on the trail. Rattlesnakes and other hazards can be found along the way. Dogs are allowed but must be kept on a leash. Want to go hiking the Swiss Alps? Here are 5 great trails for a day hike!